The rumors of Brock Lesnar back to the UFC have taken on a whole new meaning. These tidbits are no longer rumors as it does appear that Lesnar could be returning to the UFC in 2015…or elesewhere according to one report. Dave Meltzer dropped a bombshell on his latest F4Wonline.com podcast. Meltzer not only confirmed Dana White’s statements earlier this week about Brock wanting back in, but Dave reported that Brock is leaning towards a return to the UFC. The former UFC champion could return to the octagon at age 38 in 2015 in what could be one of the biggest returns in UFC history. Meltzer also mentioned that Brock may have another option. According to Dave, Bellator is very aggressive right now, especially coming off a monster rating for the Ortiz vs. Bonnar fight. Meltzer speculates that Bellator will get in the Brock Lesnar game and could make Brock a very enticing offer. Meltzer did point out that as of his podcast, there had been no talks between Lesnar and Bellator. Brock will become one of the hottest free agents at the perfect time next spring. While Brock has always had plenty of leverage to negotiate the WWE and the UFC against each other for his services, he now has a new suitor in the mix. 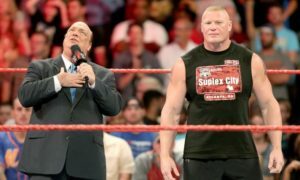 Brock is not known for his company loyalty so it will come down to what Brock Lesnar’s goals are in 2015 and whether UFC, WWE, or Bellator can meet them better than the others. The timing of this story couldn’t come at a worse time for the WWE. The economics of the company have completely changed with the network. The money and incentive to sign Brock back in 2012 just don’t make sense under the new business plan. Could they outmatch the others? Sure, but it makes no fiscal sense to do so. In 2012 they had much more leverage with better finances and a Brock who was coming off his worst fight in UFC history. Those advantages won’t exits during these negotiations. Making matters worse is that Brock is currently walking around with the WWE title. The working plan was to leave the belt on Brock through WrestleMania and have the Beast Incarnate drop it to Roman Reigns. I think that changes with these stories. If these stories are out now, imagine how hot these rumors and stories will get by Mania. Remember the last time Brock worked a WrestleMania on the way out? It didn’t go well. I would be shocked if Brock leaves the Rumble with the title in light of these latest developments. I think if Brock is getting back into the MMA game that there is no question he is signing with the UFC. Brock is a guy that appears to want the best competition in whatever sport he is competing. He could have played football or tried out in the CFL but instead went to the NFL. He could have went to Strikeforce but instead went to the UFC. This is a guy that wants to fight the best and the UFC is the only place that is going to happen. Let’s be frank. The UFC needs Brock Lesnar more than Brock needs the UFC. He is the biggest draw in company history and has yet to be replaced. I have no doubts that the UFC will do everything in their power to bring him back. I don’t think he is beating Cain or JDS but you never know. Maybe he gets lucky against a couple of guys and catches someone like Werdum in transition? It can happen. Nobody ever expected him to win the heavyweight title the first time. I won’t bet against Brock Lesnar.